Trichogramma species parasitize eggs of over 200 species of moth and caterpillars. Among these are; the rice and corn stem borer, cabbageworm, tomato hornworm, Heliotis and Helicoverpa species, codling moth, cutworm, armyworm, webworm, cabbage looper, fruit worms, and sugarcane borer. Trichogramma adults are extremely small. The female adult lays her eggs on other moths' eggs. First, she examines the eggs by antennal drumming, then drills into the eggs with her ovipositor, and lays one or more eggs inside the moth's eggs. She usually stays on or near the host eggs until all or most of them are parasitized. When the parasitized moth's eggs turn black, the larvae parasites develop within the host eggs. The larva eats the contents of the moth's eggs. Adults emerge about 5-10 days later depending on the temperature. Adults can live up to 14 days after emergence. Female adults can lay up to 300 eggs. Trichogramma species differ in their searching behavior, host preferences, response to environmental conditions, and suitability in biological control uses. The timing of Trichogramma releases in the field is important. Non-parasitism could be due to the use of less suitable Trichogramma strains to the host pests, environmental conditions, and untimely release of parasitoids. It is best to release of parasitoids at the beginning of a pest infestation (when moths are first seen in the field), followed by regular releases until a natural breeding population of Trichogramma is established. An example of this approach is the corn borer control. The first release should be during the first appearance of moths and corn borers' eggs in the cornfields. Weekly releases thereafter are to ensure the Trichogramma population build-up and parasitism occurrence. The build-up of the parasitoids depends on the presence of the pest or alternative hosts and food for adults. It is important to regulary monitor pest population, egg parasitism (parasitized eggs are black in color), and the larval infestation. 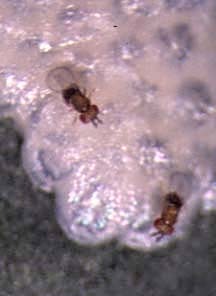 Trichogramma are released as pupae in parasitized host eggs. The pupae can be pasted on cards or put in various containers. To be successful in the field, food, host eggs and shelter must be available. Modify cropping practices by practicing crop rotation and by planting cultivars which are favorable to Trichogramma population build-up such as wild carrots, dill, golden rod, leguminous plants, and flowering vegetables. Adults feed only on nectar, pollen, and honeydew. Many of these species are found naturally occurring in agricultural and garden habitats. Many adult parasitoids and predators benefit from sources of nectar and the protection provided by refuges such as hedgerows, cover crops, and weedy borders. Avoid indiscriminate use of hazardous pesticides to ensure their presence in agricultural fields. Bureau of Plant Industry. (1994): Trichogramma. Manual for farmers training. Department of Agriculture. Manila, Philippines. Tran, L.; Hassan, SA. (1986): Preliminary results on the utilization of Trichogramma evanescens to control the Asian corn borer Ostrinia furnacalis in the Philippines. J. Appl. Ent.